Swansea and Wales defender Sam Ricketts has signed for Hull in a three-year, £300,000 deal. The Swans were determined to keep hold of the 24-year-old full-back. But Hull's bid triggered a clause in his contract allowing talks and the Aylesbury man told Swansea that he was determined to go. "The chance to play in the Championship was something I couldn't turn down at this stage, what if the chance never came around again?" said Ricketts. "I thought about spending another season at Swansea to try to win promotion, but there's no guarantee of that. "I owe Swansea a lot for helping me earn international recognition, but hopefully the move will only help my Wales career." 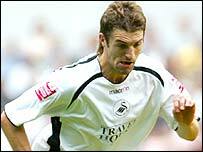 Ricketts - whose Swansea contract ran until 2008 - joined from non-League Telford in 2004 and the former Oxford trainee blossomed in south Wales, making 86 league appearances and scoring three goals. Within 12 months of stepping up a level, Ricketts was named in the League Two team of the season and had won Welsh international honours. Swansea could benefit a sell-on clause in the player's contract should he move on from Hull and have vowed to pour all the transfer money back into squad strengthening. Swansea manager Kenny Jackett believes that the defender has made a poor choice. "Obviously I'm biased, but I believe his career would have been better served staying at Swansea," said Jackett. "He's settled here, well-valued, and has pretty much an automatic place. "I wouldn't say he's risking his international place, but there's been a lot of focus on him playing in Wales and that has helped his security in the squad. "I'd have liked him to have one more crack at promotion here. If we'd failed, other offers would have come in. "It's disappointing to lose someone who can play on either side of defence and has done well here, but these things happen and we will move on. "Defensive cover may now be an issue for the squad, but there's no lack of ability here and we will be able to replace Sam."